The Wabbit had the Devil's hat but as he hopped outside, he realised he was somewhere completely different. He was not outside by a long chalk. He plodded forward anyway because he was in the metro. He even knew roughly where he was - but of why he was there, he knew nothing. The hat gripped his head and made a soft noise so the Wabbit grasped it by the brim and straightened it. Now it seemed to play a tune, but it was off key. Sometimes it was flat and sometimes it was sharp. He managed to make out a rhythm, but it was a rhythm of suffering that chilled his blood. 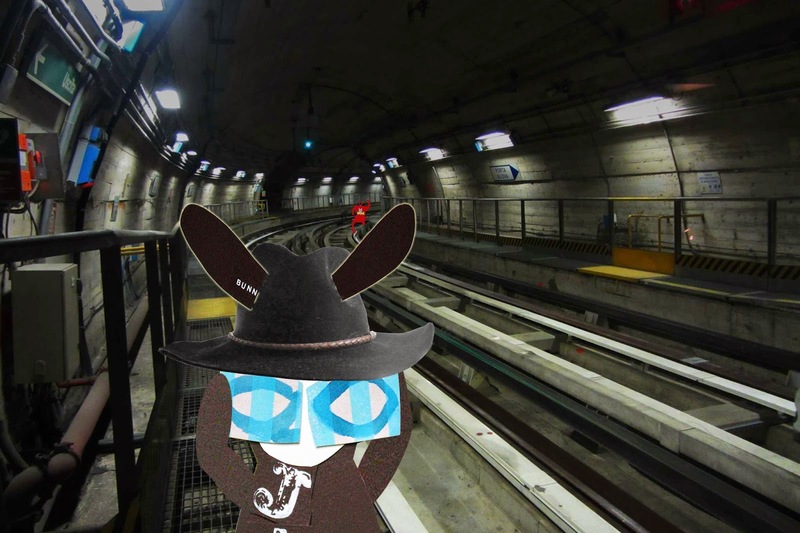 He heard lyrics but the words were out of sync and the Wabbit could hardly distinguish them from each other. So he tried to repeat the words. "The sign, the chord, the groove, the album." His words popped, clicked and crackled and sibilants hissed along the tracks like railgrinders. Then another sound seemed to call his name. "Waaaaabit!" The Wabbit kept his nerve. "By the prickling of my ears," he murmured, "something wicked this way steers." That phrase didn't sound right to the Wabbit and he was about to revise it when he heard the call again. "Wabbit! Wait!" The Wabbit put his head down and ploughed forward. But the voice called again. "What's this for a diabolical adventure?" The Wabbit relaxed and turned. In the distance, he saw Skratch scrambling along the rails and he had never been so pleased to see him. "You scared the Hell out of me!" he grinned.